This trail camera is ideal for hunters who are looking for affordable yet high-quality game camera that they can use in the field. The design is specially design for field use, and the one-year battery life is very convenient and worth investing. 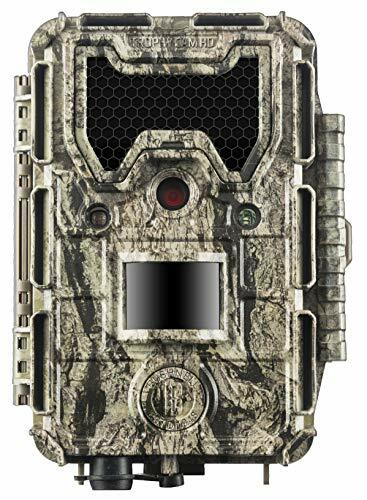 With its useful features, benefits, and a wide variety of options to choose from rest assured that you had finally found the trail camera that is ideal for you. The Bushnell Trophy Cam No Glow Trail Camera with Color Viewer is equipped with black LEDs, making it invisible to other hunters while in the field. Rest assured that the chances of your trail camera getting stolen while it’s still in the field shooting videos and capturing rare photos of wild animals. The fast trigger speed of 0.2 seconds will ensure you that any moving subject within feet radius is saved automatically. The 1080P HD video will provide you powerful and clear shots in all angles. The set-up is relatively easy with the pre-set menus and backlit 5-way buttons. Therefore, even if you are going to use a trail camera for the first time, you won’t have a hard time in setting it up even if you are in the field. Hunters always look for no-glow trail cameras as it can provide them with clear monochrome night images without startling the subject or capturing the attention of potential thieves in the forest. This trail camera is great for outdoor use. The solid plastic houses the delicate imaging components inside. Look for a perfect spot to hide your camera and rest assured that it will last for an extended period. You can locate a single latch on the side of the trail camera and holes are also available for mounting tripod. The package includes both the USB cable and straps as well. You don’t need to use the highest quality settings for both videos and cameras as it will still provide you a premium quality of shots taken. It will also help you to save some room to your SD card and capture more images and videos before you the storage is full. The one-year battery is everything you could ask. Even after 30 days of using the trail camera, you can see that you still have a full battery. While it might be a bit costly, it’s worth it especially if you get to capture rare photos of wild animals roaming around the forest and claiming their territory. If you are looking for a security camera but do not want to burn a hole in your pocket with expensive home CCTV cameras, this one is for you. You can use it as your security camera. The set-up is relatively easy. The quality of the pictures is the best. Even from 20 yards, you can still see the image clearly if you zoom it. You can easily hide the trail camera in trees and branches. You just need to make sure that there is no moving vegetation present around the camera’s area so that you can prevent capturing white images. Despite the wide variety of settings that it offers, this trail camera is lightweight and compact. Therefore it will not easily fall off quickly if you are planning to hang it in a tree or high places. Because this is not a Wi-Fi device, unfortunately, you are not allowed to view the live images while you are in the field. You have to get the SD card first and plug it in your laptop to see what you had captured so far. Aside from that, the settings for video mode is insufficient. You are not allowed to set the time duration for the video. You should make sure that you choose a very safe place to put your camera because the screen can be quite sensitive. There are some reports from the customers claiming that the camera’s screen went dead after exposure to harsh elements of nature in just a few weeks. The quality issue of the screen will require the hunter to look for the perfect place to hide the camera in the forest—the one that can protect it from extreme sunlight and rain but provides the best angle in case wild animals roam around. When the camera tends to capture a photo, a red light will keep on blinking. This red light indication may attract the thieves in the forest. Therefore, you should disable it before you place it in the field. However, the settings for disabling the red light is still not found by most of the users so you might want to address it to the manufacturer or just only cover the red light with a black electrical tape for the meantime. It is a great camera for a reasonable price. It’s one of the trail cameras that every hunter should own. Its own set of advantages and disadvantages makes it convenient to have in the field. If you don’t mind the minimal flaws of the camera, it is something worth investing regardless if you are going to use it as a deer hunting trail camera or a home CCTV camera.